Diet Coke Can Save Your Life, created through an NCCI grant at Montclair State University, is a repertory work for 5-15 women. 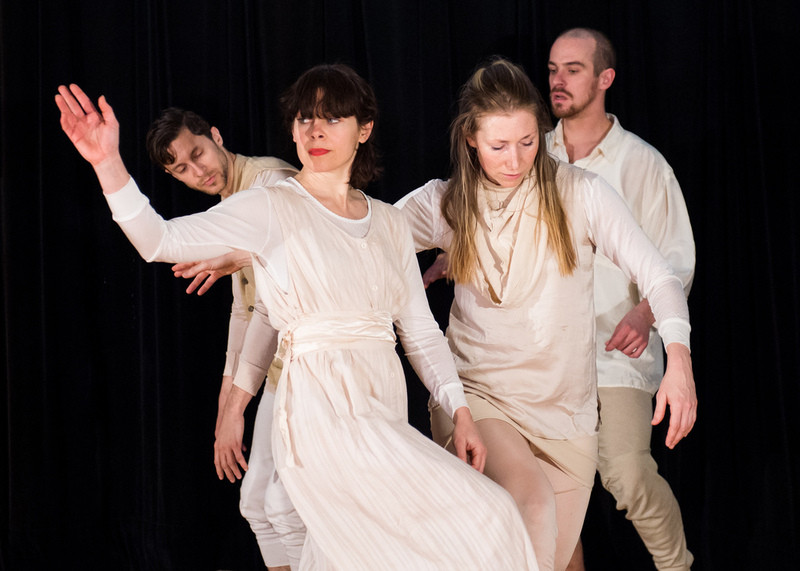 The work has been re-created on Alexandra Beller/Dances, Rhode Island College, and others with the help of Dance Space Center’s Artist in Residency Program. Using gestures drawn from mass media, Ball gowns made entirely of diet coke cans, and a sound score of infomercials and driving music, DCCSYL an examination America’s cultural obsession with physical perfection, especially in women. Dangling Fruits of Joy or How To Make Love, originally a quartet, has been stretched and condensed for different company situations into either a duet or apiece for as many as twelve. Attacking mythologies surrounding gender, "Dangling Fruits of Joy or How to Make Love" asks "what makes a man a man and a woman a woman in the eyes of society." Challenging, provocative and philosophical, the work is also vigorous, dramatic, and ripe with humor. Called "smart and startling" by Elizabeth Zimmer and "hilariously perverted" by Deborah Jowitt, "Dangling Fruits of Joy or How to Make Love" continues to garner critical and popular acclaim. Why Things Fall, commissioned by P.S.122’s New Stuff Series, has been described as “an athletic, mercurial, dynamic dialogue with fate.” It is a quintet created in response to the events on September 11th, 2001. An abstract response, we investigate why things fall apart and what the social expectations are for comfort in the face of tragedy. Set to an original collage score with slides by photographer Amy Upton, it is a physically arduous work requiring, as does recovery from grief, diligence, observation, and a willingness to fall. The work has been set on numerous companies and Universities in the United States and continues to garner critical acclaim. Sifting Miracles, a solo for Alexandra Beller, this solo shows the underbelly of unrequited love: solitude, fantasy, denial and the simplicity of loss. A swiftly paced story of memory and defeat told by a woman who is finding herself in the shadow of her former lover. Articulate and delicate dancing team up with straightforward and nuanced text by both Beller and the poet Mark Strand. Moving Men or Telling Left From Right, commissioned by Dixon Place,is a repertory work for nine men, one woman and a roasted chicken. Using chicken as a metaphor for the male fear of intimacy, the work is a raucous and hilarious love duet. Or Are You Just Happy To See Me?, is an extremely physical and athletic women's quintet which addresses the function of desire and examines both the male and female role in sexual politics. Danced to a suite of songs by Tom Waits and text spoken and sung by the dancers, the work is a visceral and rugged tour de force. It has been set on Rhode Island College, and the University of South Florida among others.